Home » Cheap and Good? 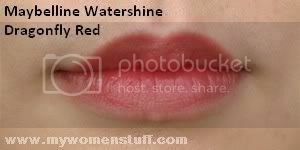 » Maybelline Watershine Lipsticks rock! Every now and again, you come across something cheap that works great and you end up wondering why you ever spent any money on high end products when low end ones work just as well! My recent revelation is the Maybelline Watershine lipstick. Retailing at something like a mere RM18.90 a lippie, this lipstick is a perfect dupe of high end glossy sheer lipsticks, like Clinique Buttershine lipsticks which retails for RM65. You can buy 2.7 Maybelline Watershine lipsticks with one Buttershine! The Maybelline Watershine lipstick is very smooth and does a good job of moisturising my lips or at the least doesn’t dry it out. Furthermore, it is glossy and sheer yet imparting just enough colour on the lips and best of all, has no discernable fragrance. I have been wearing Dragonfly Red, which is a bright bright red in the tube. Just looking at it, you’d think its a lipstick that can only see the light of day for night events, paradoxical as it sounds. However, worn on the lips it is a sheer glossy warm red that I can pull off for everyday use at the office. I like it in particular for the fact that it brightens up my whole face especially when I’m not feeling up to putting on lots of colour on the rest of my face. I am pleasantly surprised at finding something so cheap that works so well! 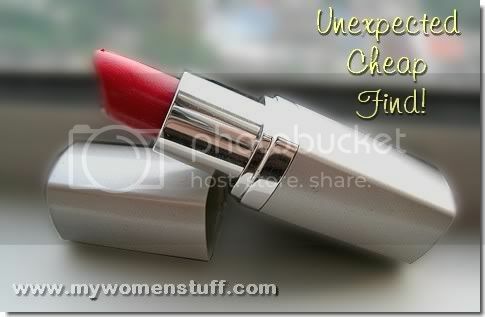 NEXT POST: Tips: How to choose a lipstick colour? I love maybelline lippies as well! but they just disappear on me after several hours…well all lipstick does!!! and I have super dry lips so wearing this alone won’t work, i would need a balm before the lippy! 🙂 wow..your lips look cute..that’s why you’re ok to use bright colored lippy..me I can’t 🙁 thick full lips! Tine: Its a pretty impressive find for something so cheap eh? Nikki: Thank you! Lots of people will kill for full lips! 🙂 Ah Maybelline definitely doesn’t get props for staying power and I’d agree that it may not work all that well for dry lips. Yeah, I agree with Nikki. You’ve got cute lips…a very pretty shape! Hmmm…very tempted to try after reading your review. Honestly, I don’t remember trying anything from Mabelline before. Maybe their mascara. The watershine has been available for ages, has it not? I remember using it once before, and my colleague goes, “do you want your lips to look THAT oily?” anyways, that was before she knew glossy lips was all the rage. Hey, is that photo taken with your new cam? cos if it is, girl…that photo RAWKS! now i understand why do you enjoy red lipstick COZ YOU LOOK FABULOUS!!! seriously, you have to wear more reds. Oh wow, that color looks so good on you! 🙂 And funny how it seems so chili red in the tube but so nice on the lips. Sesame: Do try this one. Its a cheap boost and thank you! I totally agree! I’ve 3 colours in this lipstick! I love how inexpensive they are, and really are very moisturizing! And yes, totally cute lips-hehe! I have the same big lip problem as nikki. Most bright colours look a bit overpowering, so I have to be careful with the colours I use. Is that photo published as is, or did you have to do some effects to it first? Great shot! Ooh I would love to give this a try.. But I wouldn’t know which shade is the best for me, trying out on my hand is useless since my skin is a lot darker there..
Do you think you could recommend some colours that would work for a typical chinese-malay complexion? hi i would like to ask if u know a website that sells this lipstick. i live in l.a. and they don’t have the watershine collection at any drugstores here. I hope u have the time to reply. thanks in advance. I’m sorry I have no idea where you can get this online Elena. You could try ebay?